Some exhibitions well worth catching and an interesting use of a traverser! 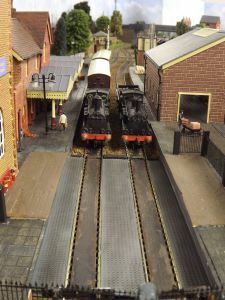 This Saturday I will be assisting fellow High Wycombe and District MRS members Alan and Simon Paley with their delightful Pre-Grouping Midland and London North Western Railway layout Loughborough Road at the Milton Keynes Model Railway Society’s exhibition being held at the Stantonbury Leisure Centre, Stantonbury, Milton Keynes. MK14 6BN. A nice unusual feature of Loughborough Road is the working traverser at the end of the platforms.